How Long Does It Take To Improve In CrossFit? Over 5 years ago, we launched our “Fitness Level” and “Weaknesses” features as part of our new Analyze section. These features were designed to give athletes more information and analysis about their workouts and their physical capacity. For every athlete on our site, we calculate their “Fitness Level”, which is a single number from 1-99 that represents their overall Fitness. This is a single number that captures how an athletes performance stacks up to the rest of the community. Greg Glassman defined fitness and with it started a fitness revolution. However, it was still tough to figure out how Fit an athlete was at any given time. We set out and solved this problem with Fitness Level. Now, by performing a hand-full of workouts, we can accurately calculate how fit an athlete is at any given time. With a handful Games athletes using our platform, we’ve found that games caliber athletes need to be at an overall Fitness Level of at least 95, with most Workout Levels at 98 or above. This insight opened the door to many other questions, mainly, “How long will it take to improve in CrossFit?”. 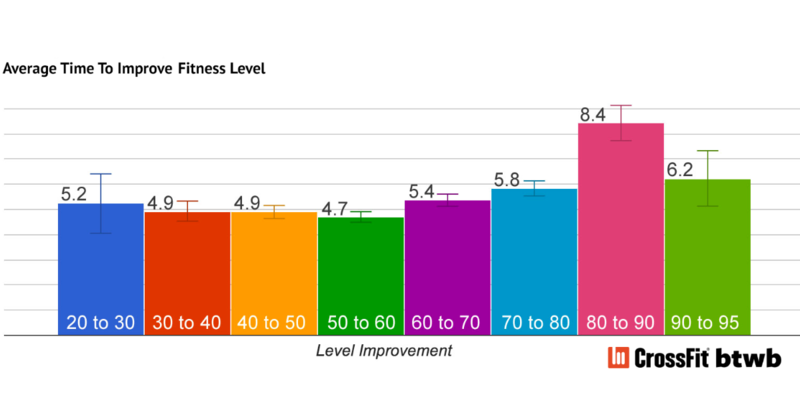 On average, it takes about 5-6 months to improve your Fitness Level by 10 levels. When you are fairly new to CrossFit®, you can improve at a pretty quick rate. If you’re currently between 1-60, stay committed and consistent because you have a chance to raise your Fitness Level by 20 levels per year. In fact, on average, it takes 19 Months to improve from a level 50 to a level 80. In short, eat well and get to your CrossFit Affiliate a few times a week. On average, it takes about 5-6 months to improve your Fitness Level by 10 levels. This rate holds true until you get to Level 80. Going from level 80 to 90 takes over 8 months, on average, which is 45% longer than it takes to go from 70 to 80. To qualify for Sanctioned Events, you need to be near a level 90. To qualify for Sanctioned Events, you need to be near a level 90. To get to a level 95, which is near Games level, it takes about 6 additional months. As your level gets higher and higher, it becomes more and more difficult to continue increasing your level. The difference between one or two levels at the top is huge. “I have really prioritized my goal of training for the CrossFit Games and with that comes prioritizing sleep, nutrition, and recovery,” Julie Foucher recently told us. Nutrition and sleep play a big factor in increasing your Fitness Level. Although they might not have the same diets, it seems most advanced and elite CrossFitters pay attention to how they eat and sleep. If you’re looking for more information a great place to start is Zone Meal Plans or talking to a trainer at a CrossFit Affiliate. Below is a Fitness Level histogram of Nick Robles. In 2012, he finished 123rd in the Open for the SoCal Region with a Fitness Level of 82. In 2013, he finished 95th with a Fitness Level of 86. In 2014, he finished 34th with a Fitness Level of 88, earning him a qualifying spot at Regionals. It took him 16.5 months to increase his Fitness Level from a 50 to an 80, which is slightly above average. It took him another 8.5 months to go from an 80 to a 90, which is just about average. This phenomenon is similar to what Mark Rippetoe calls the “Novice Effect”. In the first 2 to 3 years of training, you see fast improvement. But as time moves on, improvement slows and it often takes more extra work and advanced programming to get to the higher levels. He designed this chart specifically for Strength development, but the data suggests that there is a similar effect going on in CrossFit® training as well. As you can see in the above analysis, it takes quite a few years of consistent training to get to a competitive level in CrossFit®. Keep in mind though, that it is getting harder every year. If someone is just starting now, in 5 years the bar will have moved even higher. We still believe that making it to a Sanctioned Event is an attainable goal for some of our top members, but the possibility of a brand new member getting there anytime soon is getting a lot less likely. Combining all the data discussed above here is a theoretical journey in CrossFit. We are confident that if you stay consistent with training and eat/sleep/rest well you will be able to increase your Fitness Level at a similar rate. Although in the beginning you will definitely see results and become a lot fitter, it will take some time to become very fit(Level 80+). That’s the reality and sadly it’s contrary to a lot of other fitness claims. In Fitness, just like life, the journey is the reward. Enjoy it. In Fitness, just like life, the journey is the reward. Enjoy it. To answer the questions in this article, we looked at Fitness Level data from over 65,000 athletes over the past 6 years. Because of the breadth and depth of our dataset, we can pull out some pretty awesome time series trends. We will continue publishing these types of articles in an effort to increase the data-drvien knowledge available in our community. We hope this will help further the evolution and improvement of our fitness methodologies. Written by Jonathan Kinnick and Moe Naqvi. Feel free to hit us up with questions or comments.